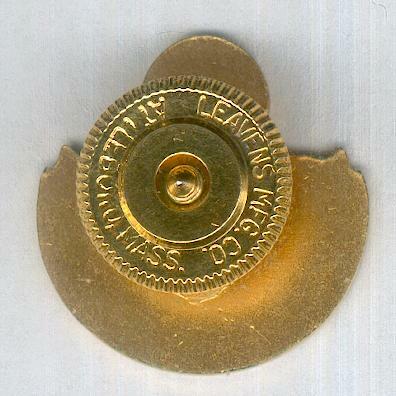 Shield-shaped gilt and enamel badge; the face with a central gilt shield bearing the black figure ‘2’ on a white enamel ground inscribed ‘NO ACCIDENT’ above and ‘YEAR AWARD’ below, a green ribbon below inscribed in gilt letters ‘MOGUL OF IRELAND MINE LTD.’, a roundel above with a gilt-edged green enamel Greek cross on a white enamel ground within a gilt-edged green enamel ring inscribed in gilt letters ‘GREEN CROSS FOR SAFETY’; the reverse plain gilt with screw post and plate for wear with maker’s mark of Leavens Mfg. Co. of Attleboro, Mass, U.S.A.; width 17.55mm (0.69 inch). 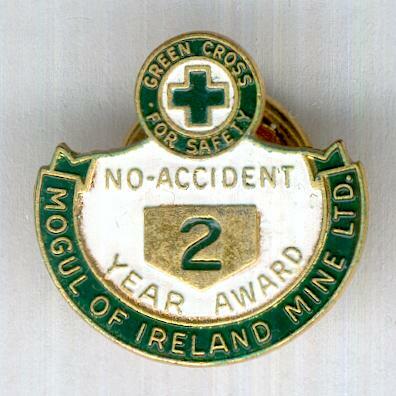 The Mogul of Ireland Mine in County Tipperary was an underground lead/zinc operation active between 1968 and 1982.